Boran Burchhardt, Folkwang Museum Essen (Exhibition: Hacking the City), Kunstverein Heidelberg. The project uses a system of signs to navigate the legal gray area of medical care for people without health insurance, residence permits and papers. 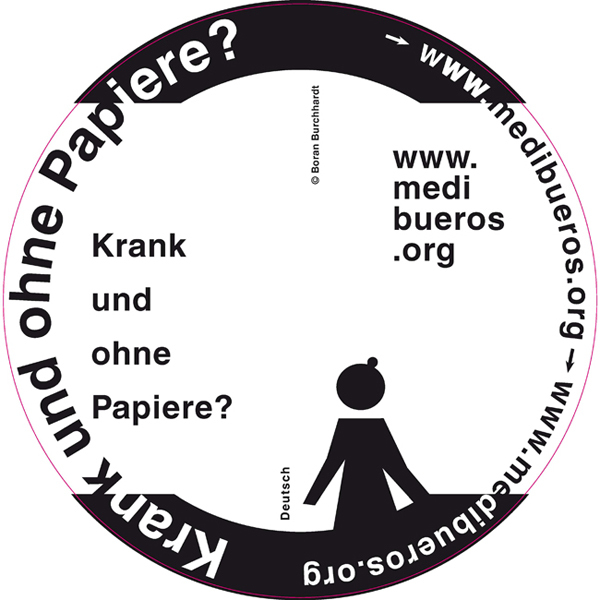 In the form of a sticker attached on the back side of parking zone signs in over 50 languages the artist informs the public about the network of medical offices. The project started in 2010 in Essen and continued to Heidelberg and Hamburg. An extension to other cities around the Ruhr and Northern Germany is in preparation. The title alludes to Article 87 of the Residence Act, that committs public employees to report â€˜undocumentedâ€™ persons. This contrasts with medical confidentiality to protect patient privacy. which is for everyone readable and visible, but its effects stay invisible. To offer information on medical care to those without health insurance, residence permits and papers in 50 different languages, referring them to the MedibÃ¼ros offices. MedibÃ¼ros are non-governmental contact points, established with the aim of giving anonymous and free medical assistance to illegals. In addition, the project also seeks to raise awareness of the issue with those who walk past the sign.